The giant anaconda, the stuff of fact or fiction? In truth, the anaconda can grow to be truly massive, with its monikor as giant wholly suitable. Often shrouded in mystery, many sightings have been made of the fabled giant anaconda, but in reality, the biggest spotted anancondas are pretty large. One of the two biggest snakes, and members of the pythonos family, the anacondo can grow to a similar size as the reticulated python, but its body is typically much bigger in size than the python. With reportings of the giant anaconda growing over thirty foot in length it’s easy to see why its one of the most well known giant reptiles in existance today. The giant anaconda like its smaller sibling, is a non venoumous snake, but is still deadly due to its massive body and ability to constrict and wrap its body around its foes. giant anacondas have been reported to kill animals as large as elephants, flip boats and are natural predators. 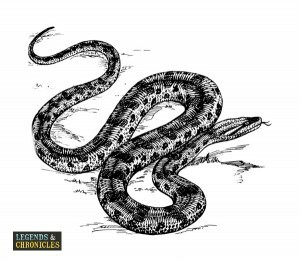 The anaconda is native to South America, and lives in a watery, warm environment, from rainforests and grassland to scrubland. 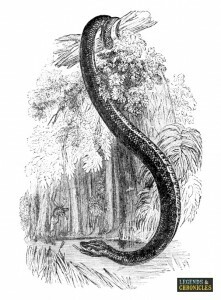 The name of the anaconda is unclear in origin, and there are multiple theories over where the name originated, including two interesting theories where the name is divired from the Tamil language. The first is anai-kondra which translates to ‘which killed an elephant’ and the word anaikoira which translates to ‘elephant killer.’ Both these descriptions are suitable and there is little doubt that a giant ananconda would be able to attack and probably kill an elephant, making the Tamil descriptions highly appropriatte. Part of the boa family, or the Boa genus, where boa actually means large serpent in Latin, the giant anaconda belongs to this family due to its hunting nature, where it will coil round its prey, suffocating and choking them before swallowing and digesting their bodies. As previously mentioned the anaconda is native to south america and its colouring and patterns reflect its habitat, allowing the anacond to successfully blend in with its environment. While the giant anaconda is not poisonous and spreads no venum through its teeth, with its natural size it doesn’t need in most cases to subdue its prey via venum. The giant ananconda still uses its teeth as a weapon, often to catch its prey in a grip before wrapping the subject up with the rest of its body, constricting and controlling. The eye and nose of the giant anaconda are positioned high up on their face, which allows the giant anaconda to keep itself hidden mostly underwater when hunting. As the giant anaconda prefers to hunt with stealth these kind of features is has are key to its success in the wild. The female giant anaconda give birth via Vivipary, meaning the mother will keep the eggs inside her body, till they hatch, meaning a live birth rather than laying eggs. Typically a giant anaconda will give birth to up to fourty babies after a six month gestation period. The young anacondas are very fragile and prone to predators in this early stage, although they adapt fast, and become capable of looking for food, swimming and moving for themselves within a few hours of birth. The young giant anacondas are quite large and are typically around two feet long, they continue to grow rapidly for the next three to four years, and soon will reach maturity. Even after the giant anacondas have reached four year old, they will still grow, but at a much reduced rate then in their maturing phase. It is well known that giant anaconda can grow exceptionally large, with recorded lenths of over 18ft. There are many more reported sightings of larger Anacondas, and even records of reported 28ft giant anacondas, although there is no hard evidence on this. It is commonly believed that the size to which a giant anaconda can grow is directly linked to the temperature of its environment. Many snake experts believe the days of us seeing snakes over 35 ft are long gone, with the current temperatures on earth unable to allow a giant anaconda to grow that big. The giant anaconda is a meat eater, a natural predator, and being one of the biggest snakes ever known, means their prey is anything too slow to get away from them. The giant anaconda will eat wild pigs, boars, deers, birds, fish, rodents, cainman jaguars and anything else it deems suitable for breakfast dinner or lunch. Interestingly the giant anaconda will swallow its prey whole, typically head first, to ensure the legs of the its prey fold up nicely when it moves down through its body. The nature of the giant anaconda jaw like all snakes allow it to detach its lower jaw to fit much larger prey into its stomach, and once there, the anacondas stomach acid will set to work disolving and digesting it. After a large feeding, the giant anaconda is more than capable of surviving weeks, months, and it has been reported up to a year before they need to feed again, but the very nature of the giant anaconda and one of the reasons they can grow so big is due to their veracious appetite. The giant anaconda favours various habitats and in most cases they tend to drift towards watery areas. The Anaconda prefer to loiter in water where possible, their ability to stay submerged in water for many minutes at a time, allows them to lay in wait for suitable prey. If the giant anaconda has its choice, they will always choose calm waters, they also like to loiter at the edges of water, where they can choose to catch shade or sunlight. Rainforests, scrublands, swamplands, grasslands and certain forests are all locations you may happen upon a giant anaconda. The giant anaconda is a native of South america, including countries like Argentina, Bolivia, Brazil, Child, Ecaduar and Peru to name a few. All the counties contained in South America are perfect for the giant anaconda, both warm, tropical and humid, and provide the ideal conditions and habitat for the giant anaconda to thrive. In 2011 a giant green Anaconda was captured and released in Surinam. The giant anaconda measured 18 ft long making it one of the largest recorted Anacondas found in the wild. In 1948 in Brazil, a newspaper published an interesting story about a giant anaconda. The headline alluded to an anaconda that had been found and reportedly weighed five tons. The accompying picture detailed the reported anaconda caught by the riverside. 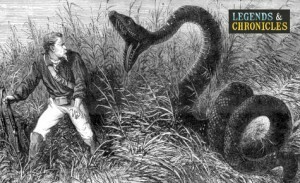 the story listed the anaconda as measuring 131 feet long, although this has never been confirmed by any other parties. In 1944 another unconfirmed sighting of a giant anaconda was documented. the sighting occured in Columbia and the anacond was repotedly 37 feet in length. Many other sightings have been documented by historians, including some with photo evidence. None of the photos in question had any accurate scale references to judge the true size of the anacondas in question, but they were reported to be over 120 feet long. The giant anaconda is one of the biggest reptiles in the world, and truly belongs in the giant reptile class. Stealthy, powerful and deadly, the giant anaconda is capable of preying on the biggest animals, with its powerful bite and deadly body wrap nothing can escape this giant snake if it sets its target on it. Not only long in length but also wide too, with bodies up a foot thick, the giant anaconda is easily one of the largest reptiles in the whole world.